One of the great things about collecting more recent eras of fashion is that there is so much choice. On the other hand, the existence of so much stuff from the past sixty years or so means that a collector has to really be careful in buying so as not to be distracted by all the choices. I’ve written before about how I really try to limit my acquisitions to the very best examples possible. When it comes to sportswear from the mid 1950s and younger, it pays to be patient and to wait until something really special hits the market. Spend some time looking at old ads from the past and you’ll quickly see that bathing suit companies didn’t just make bathing suits. All sorts of accessories and matching garments were available to the swimsuit shopper. One such garment was the matching cover-up. I spotted this set some time ago, and I really fell for it. 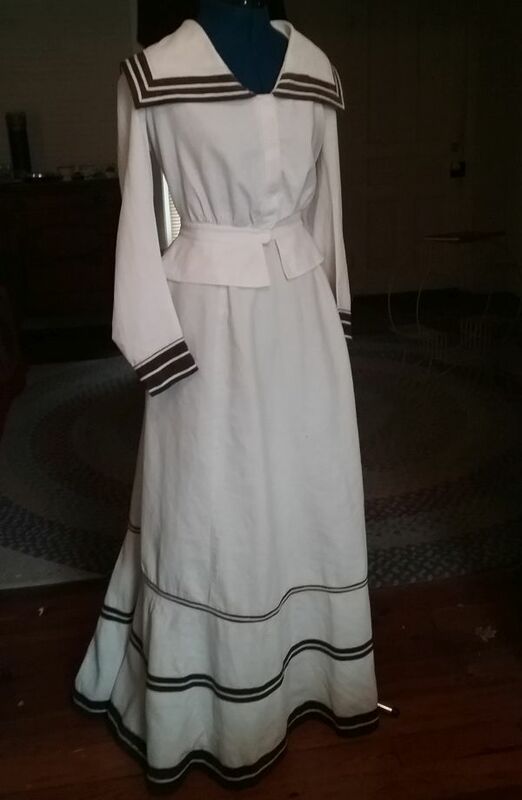 Not only was the set never worn, but there were three matching pieces. The label was one that was not represented in my collection, and the price was fair. 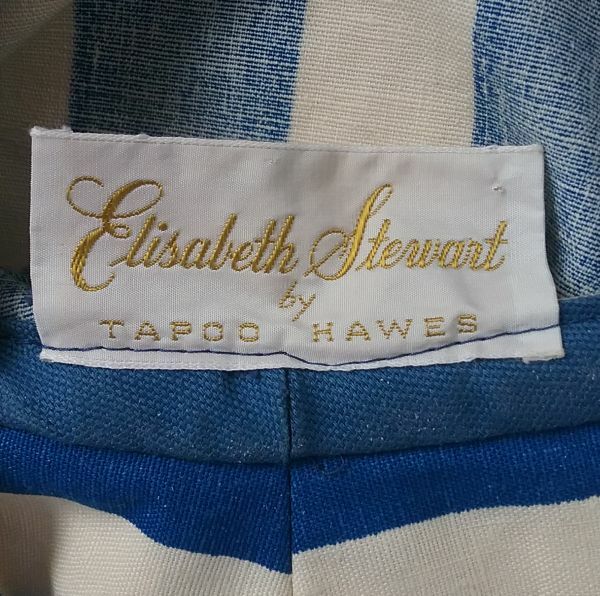 Elisabeth Stewart was the daughter of Catalina swimsuits owner, Ed Stewart. 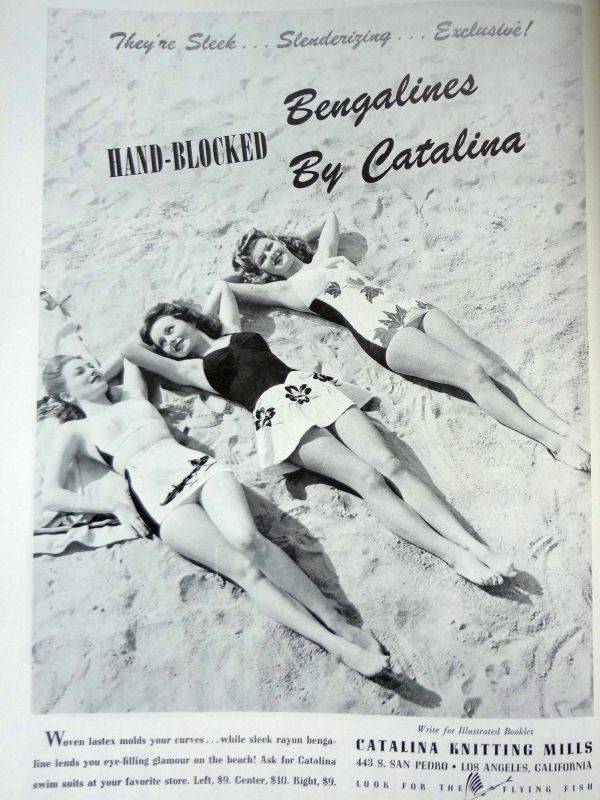 When Ed sold Catalina in 1956, Elisabeth and her brothers, David and Bill Stewart, opened their own bathing suit business in Los Angeles. 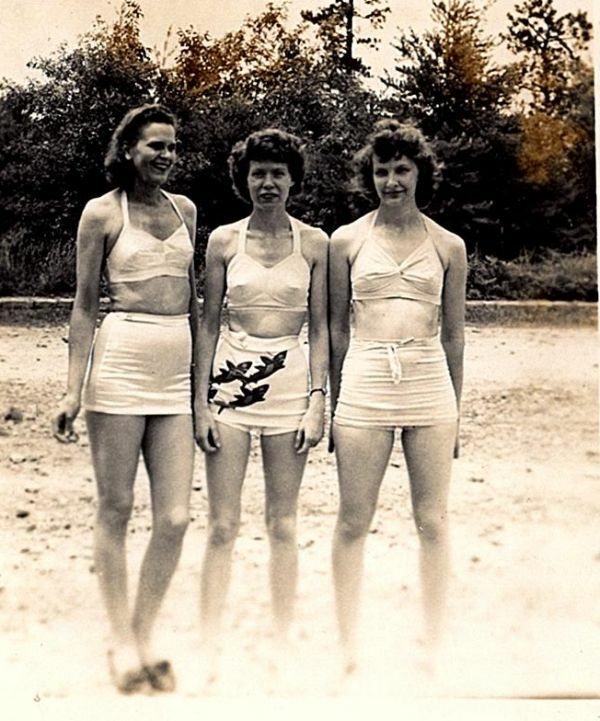 At that time swimsuit styles (along with fashion in general) were beginning to change. The hourglass New Look was fading, and straighter lines were showing up. Elisabeth Stewart’s swimsuits reflected this change. 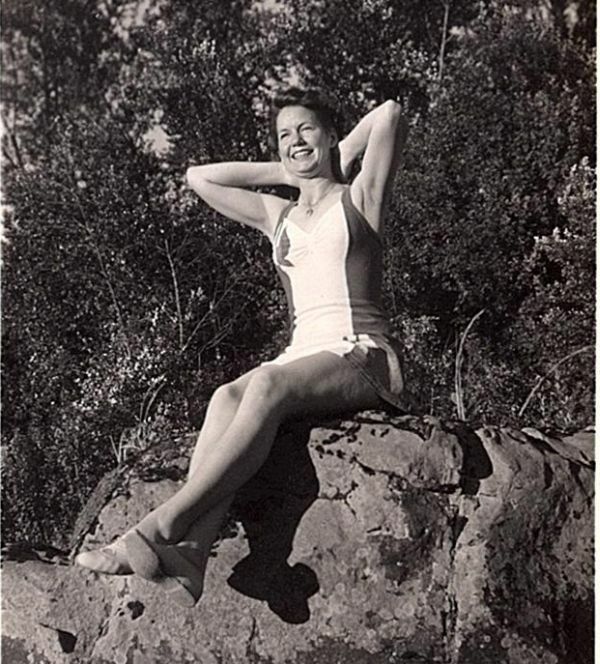 This style bathing suit, with the straight across bodice attached to shorts was made popular by designer Tina Leser who was making swimsuits for Gabar. 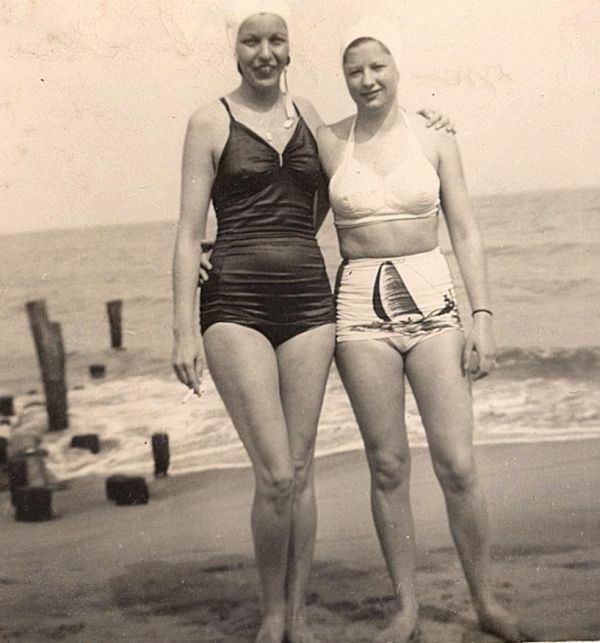 Leser was adept at making bathing suits that gave women a bit more coverage. The style must have struck a chord with women because it remains available today, sixty years later. 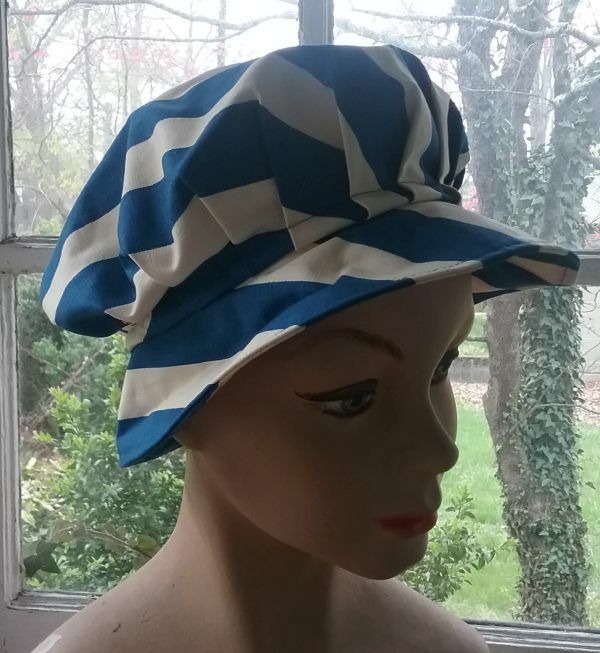 But the real icing on this bathing suit cake is this matching hat. It looks rather silly on, but it brings out a facet of the set that didn’t really occur to me until I saw the hat on the mannequin. 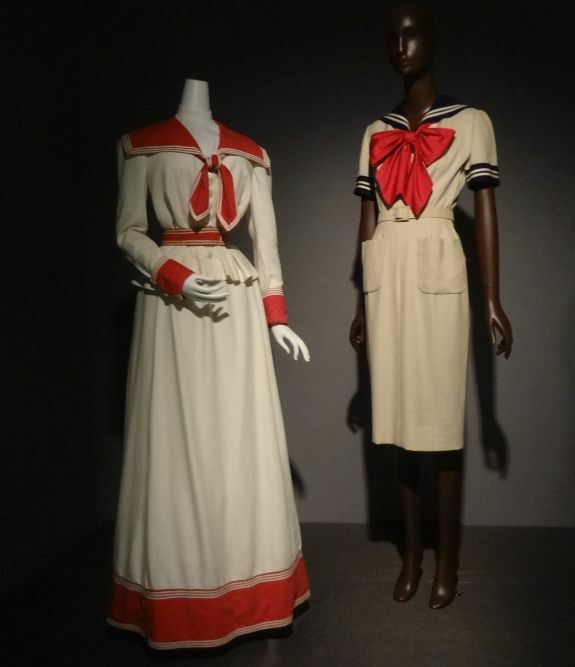 It appears to me that this suit was inspired by the old-fashioned men’s Edwardian striped knit bathing suits, along with the caps worn by Edwardian women bathers. The label I’m showing is in the hat. Tapoo Hawes was Bill Hawes, a maker of sports hats. The first reference I’ve found to Tapoo was in 1952, in Jet. By looking at some of the hats by Hawes I found for sale, I’d say he continued in business into the 1970s. 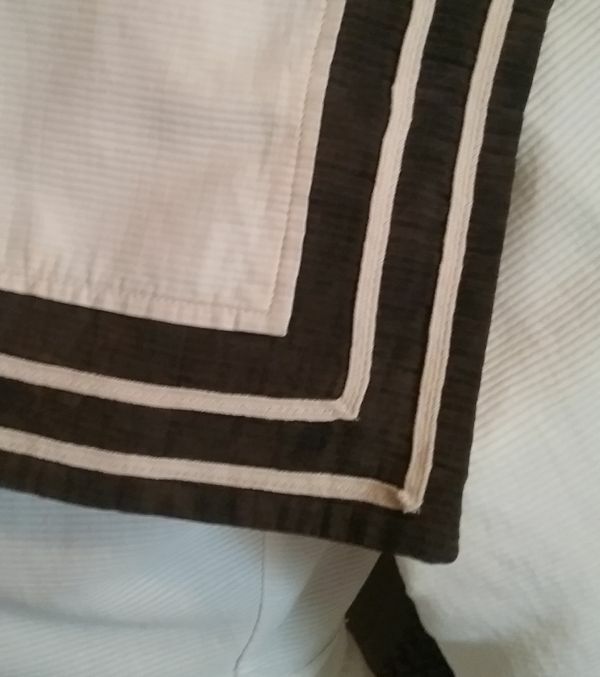 Finally, go back to my first photo to make sure you noticed how the design of the fabric was actually achieved through seams. Just beautiful! 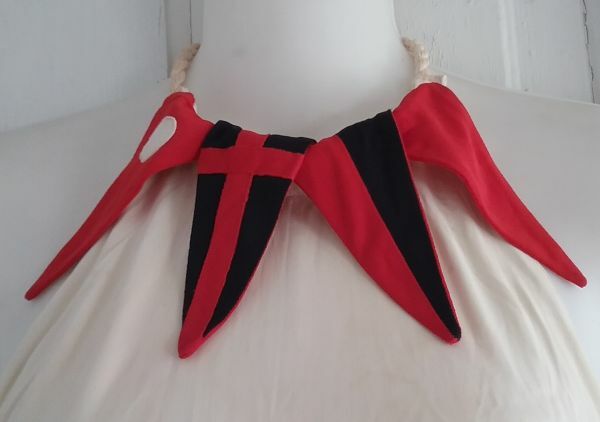 We’ve had a lot of cold and rainy days recently, and that means I’ve spent too much time prowling online selling sites looking for things I didn’t realize I had to have. The dress shown here is a great example. 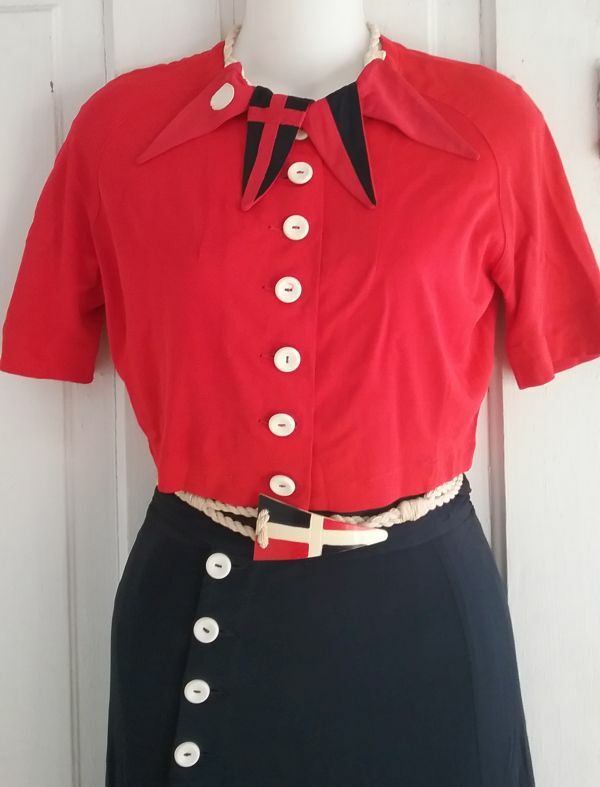 I rarely look for and buy Sixties and newer clothing online because there is so much of it selling for reasonable prices in my local markets. 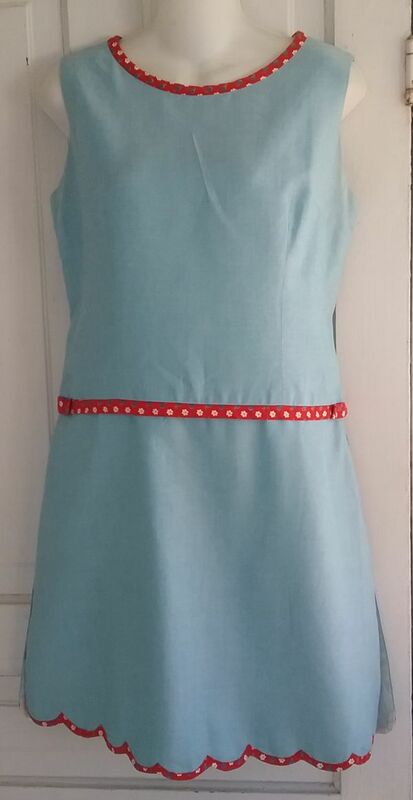 But for this golf dress I made an exception. I wasn’t familiar with this particular label, but it was the details and condition that sold me on this one. 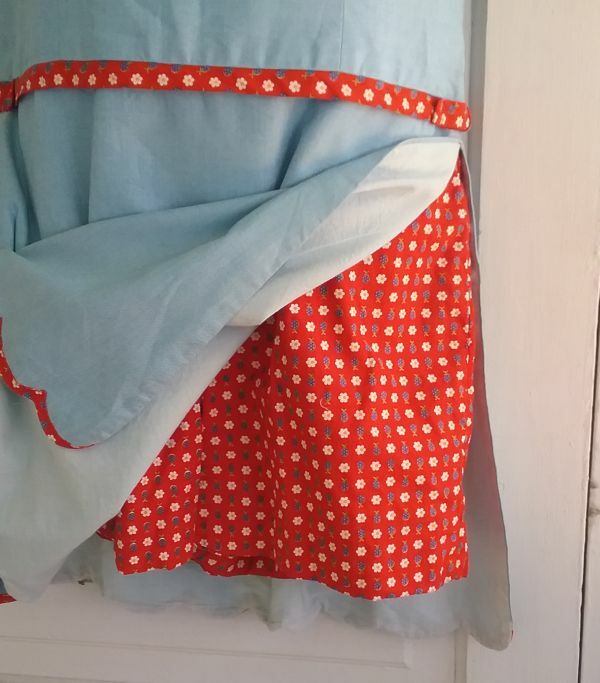 Both side seams are open to the waist to show off the little calico shorts beneath. 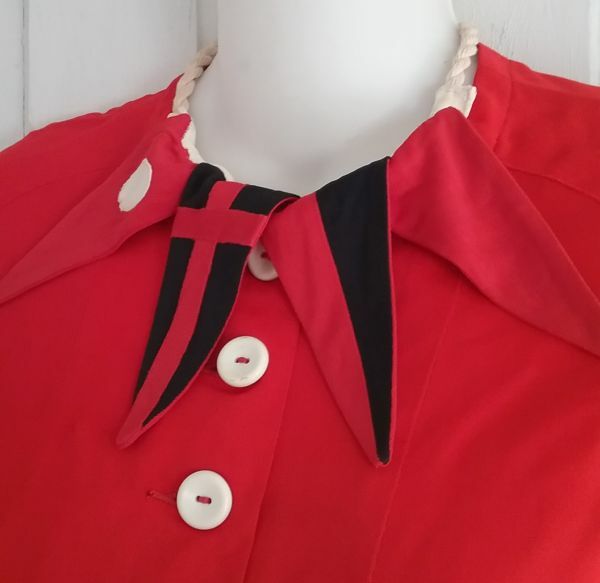 I loved how the calico was also used to trim the scalloped hem and the neckline. And I guess a bit of nostalgia was in play here because this was exactly the type of dress (we called them scooter dresses) that the girls in my school used to skirt the dress code prohibition of pants for girls. I had several of these in the late Sixties, and I can remember the teachers telling us to wear a scooter dress the next day whenever something was planned that might mean we’d be on the floor. 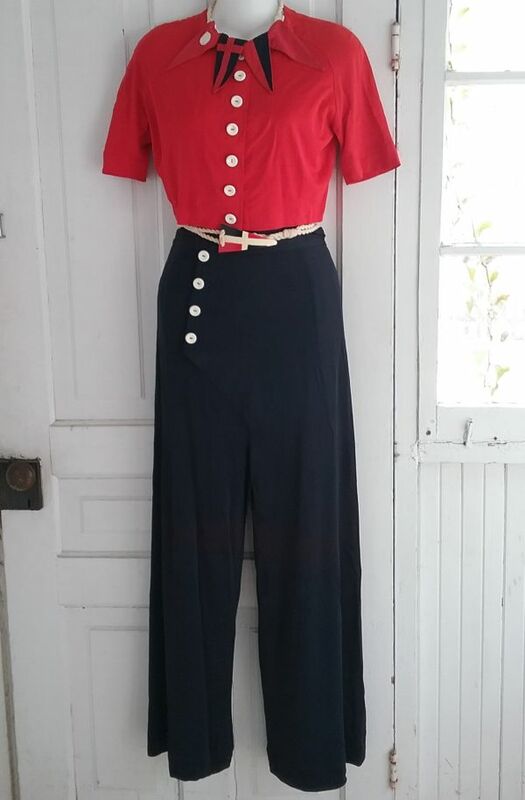 So if this was just common attire for schoolgirls in 1968, why did I want this as a golf dress? The back of the dress tells the tale. 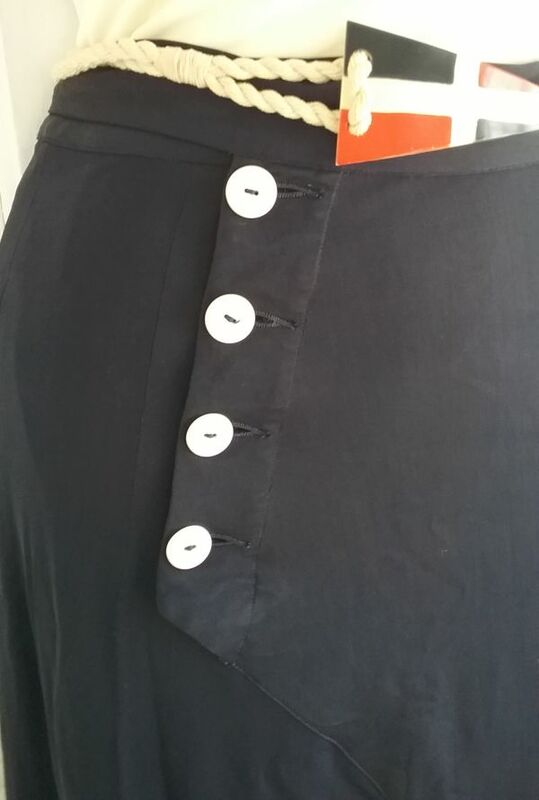 There is a pocket that has an expandable pleat, perfect for golf balls and tees. 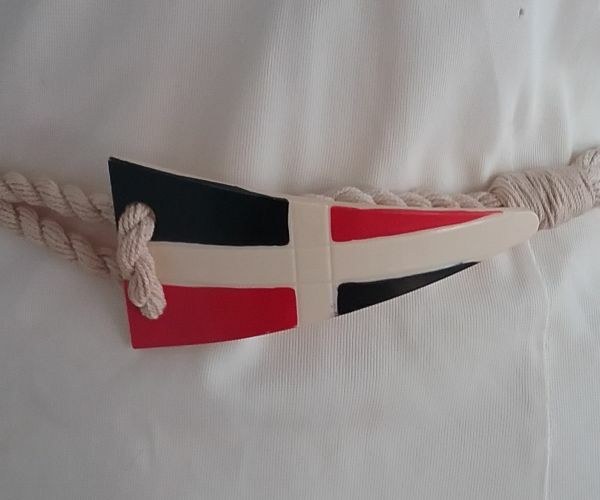 There is also a ring sewn to the other side. I really can’t say what the true function was, but I’ve seen men’s golf pants that have a towel holder in the same spot. Could that be it? 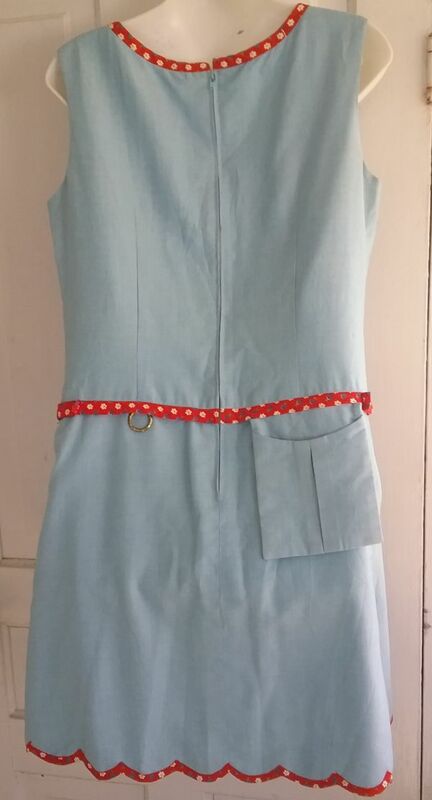 One of my favorite things about this dress is that the pocket is removable. 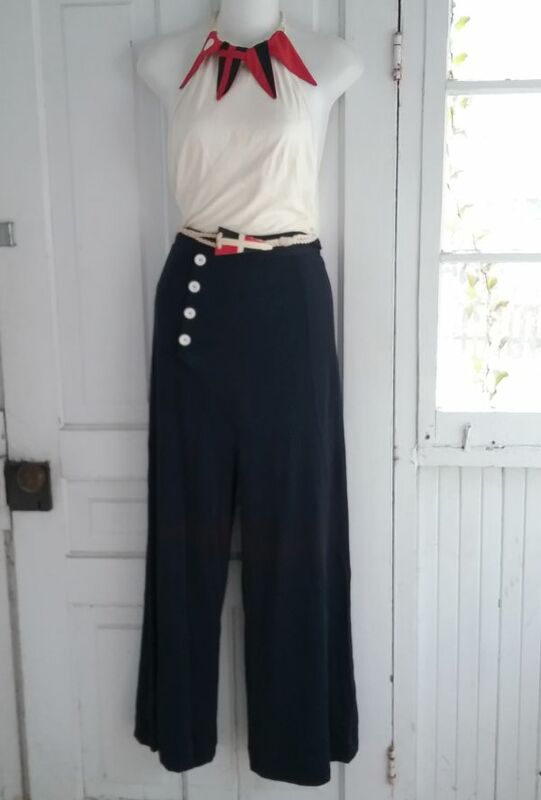 If the owner wanted to wear it off the golf course, she could without it screaming “golf dress”. 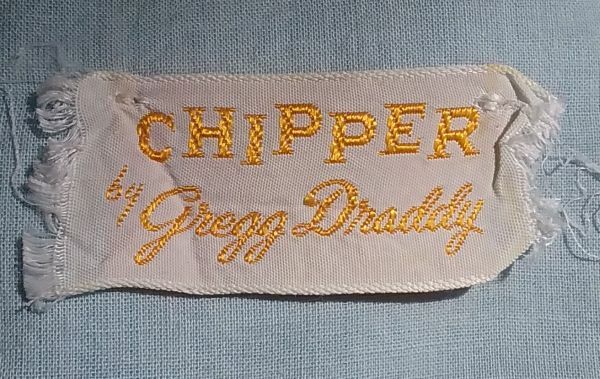 I think Chipper is a great name for a golf dress, and it also fits in with cute names of the other lines produced by Gregg Draddy: Zizzie, Tizzie, Sassy, and Steppy. I haven’t found a lot about the Gregg Draddy label, but one of the dresses I found for sale also had a Bergdorf Goodman label, so the brand was not cheap. But I already knew that from examining my dress. 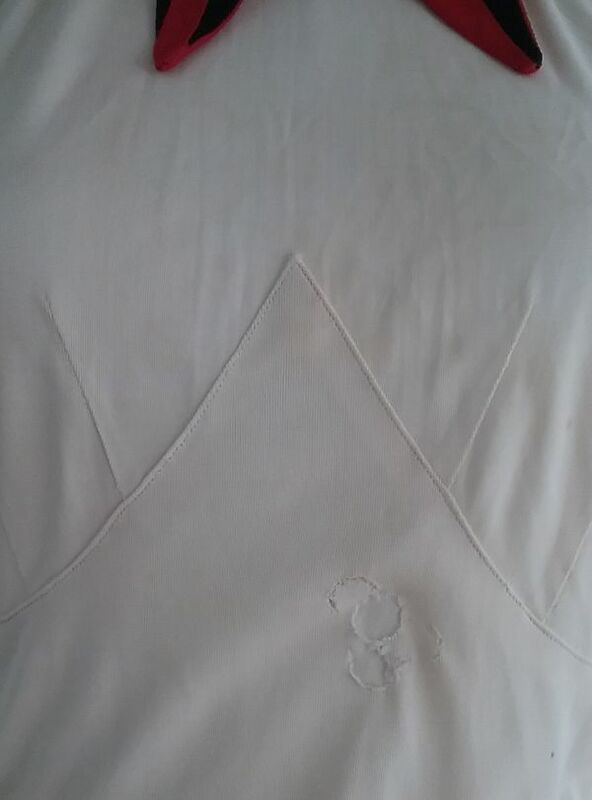 The quality is superb, with a complete cotton lining. And if not for the wear on the label, I’d have bet that this dress had never been worn. Just lovely condition. I wasn’t very successful in searching for Gregg Draddy as a person. Those familiar with sportswear may recognize the Draddy name, as it was Vin Draddy at American clothing company David Crystal, who brought the Lacoste polo shirt to America in 1950. I did find a photograph of Gregg Draddy and Vin Draddy together with a few celebrities, and I also found a reference to Gregg as a manufacturer. I’m thinking Vin and Gregg were brothers. There are descendants of Vin still around (in the Asheville area, no less) so the answers are out there. My collecting is expanding slowly back in time, and I’ll be the first to admit that I’m a bit out of my comfort zone when it comes to anything that dates before 1915. 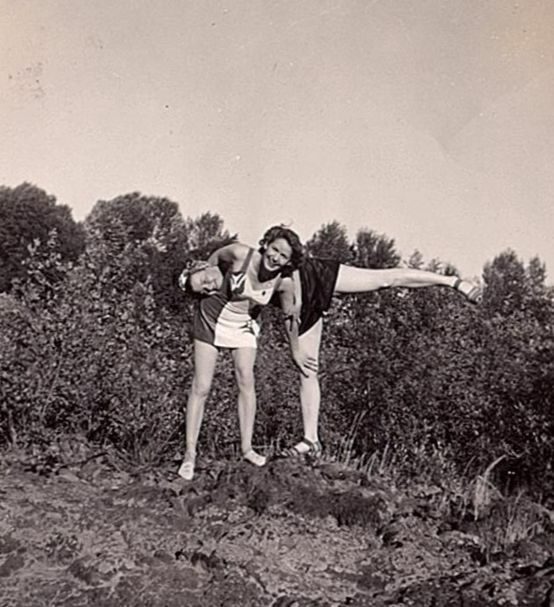 But in order to have a comprehensive collection showing how sportswear developed, one must make adjustments, as in the case of this dress. 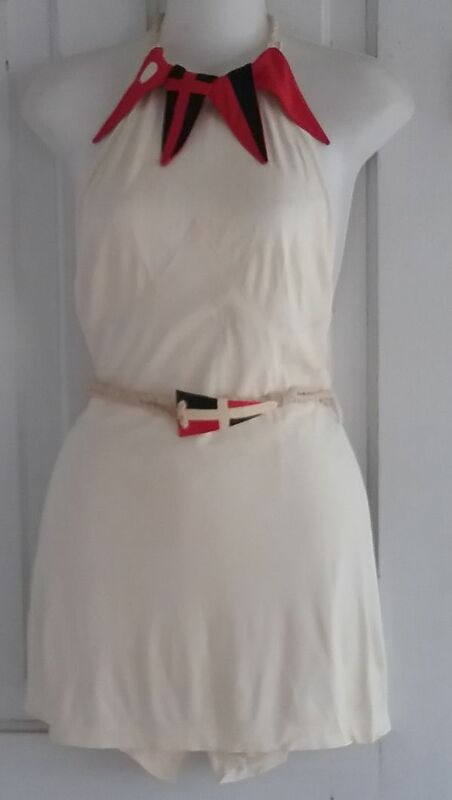 It was love at first sight, and so I added a dress for seaside promenades to my group of antique clothing. 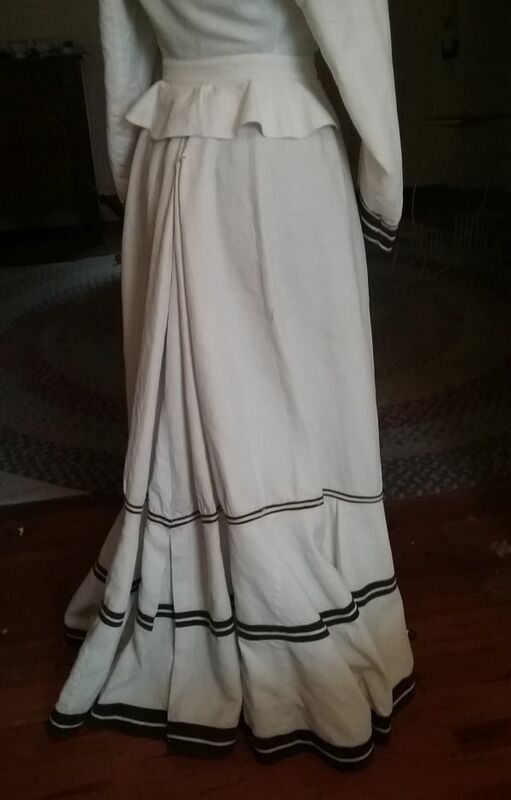 I’ve looked at pictures of old dresses and at old fashion plates until my eyes crossed, and I still could not decide on a date. 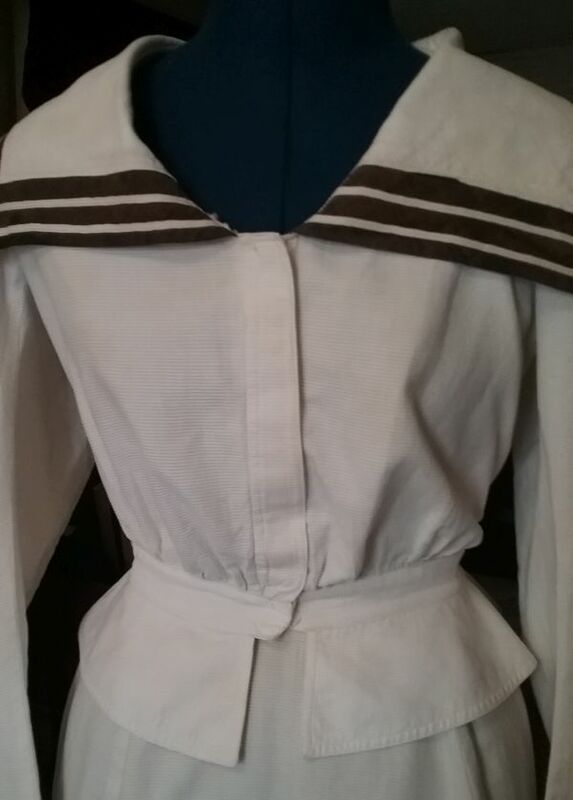 The sleeves are lighted gathered, the back of the skirt is gathered and has a bit of a tiny train effect, and there is a little peplum at the waist. 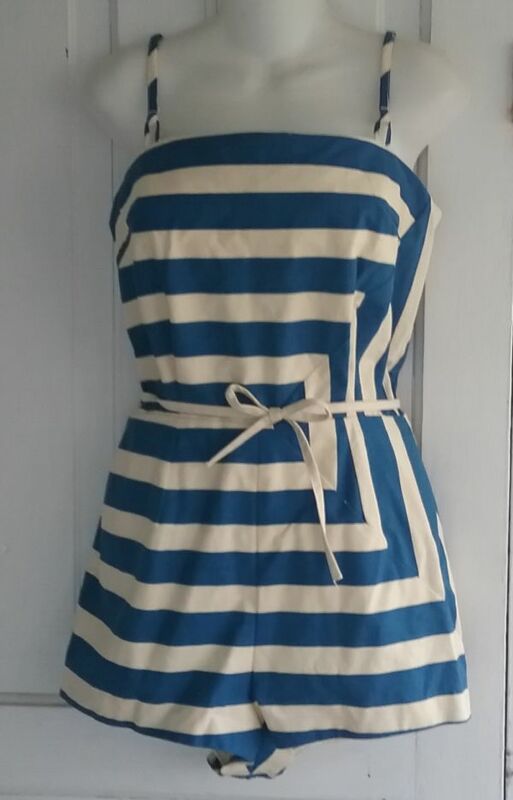 It will not hurt my feelings at all if you want to help me pin down a date on this pretty dress. 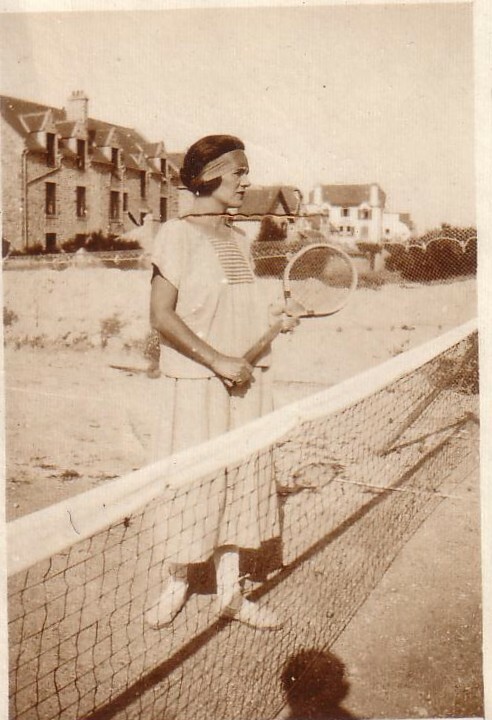 Not quite sportswear, this dress nevertheless was meant for a casual walk along the boardwalk. 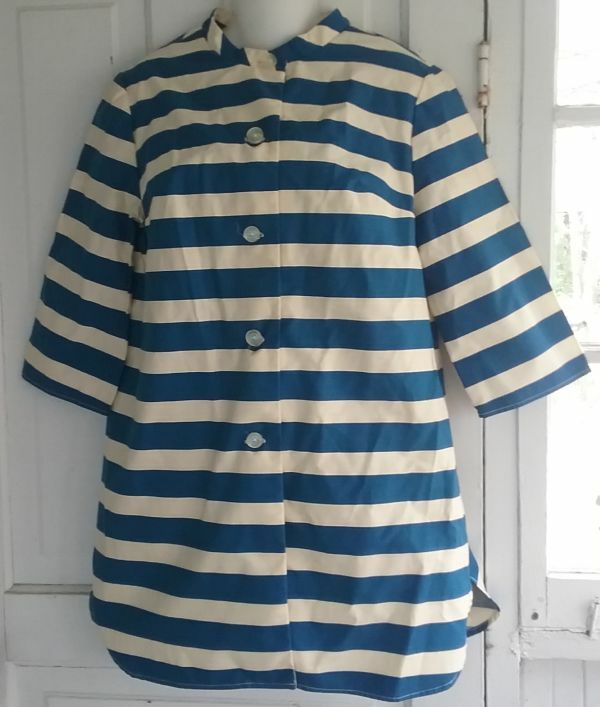 The collar and fabric stripes fairly scream “nautical”. 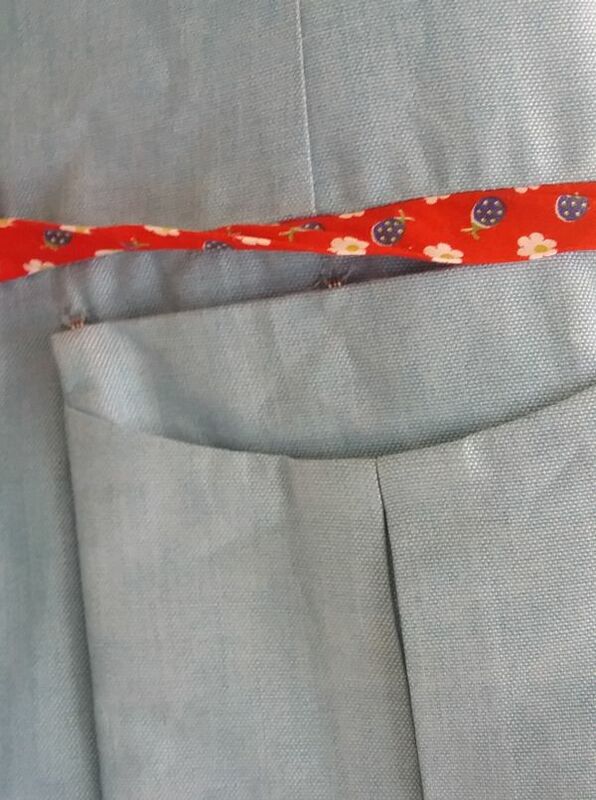 Note: the hem looks dirty, but it is not. I’m guessing my stellar photography skills added the dirt. 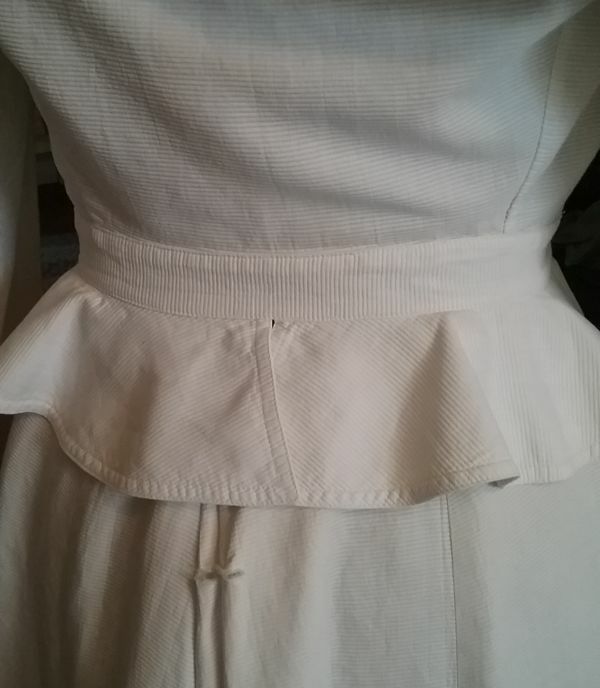 The bodice has no permanent way to close it, so I’m guessing pins were used. Actually, a former owner had applied velcro, which I removed. I looked for signs of hooks and eyes from the past, but did not detect any old stitch marks. They could have been there, however. The fabric is a fantastic cotton cord, which adds to the sporty look of the set. The peplum effect is more pronounced in the back. Maybe you can see here that the sleeves are gathered. They are also shaped with a bend in the elbow. I think what really made me want this dress was that I was so crazy about a similar one in the collection at the Museum at FIT. I took this photo of their Uniformity exhibition in 2016. 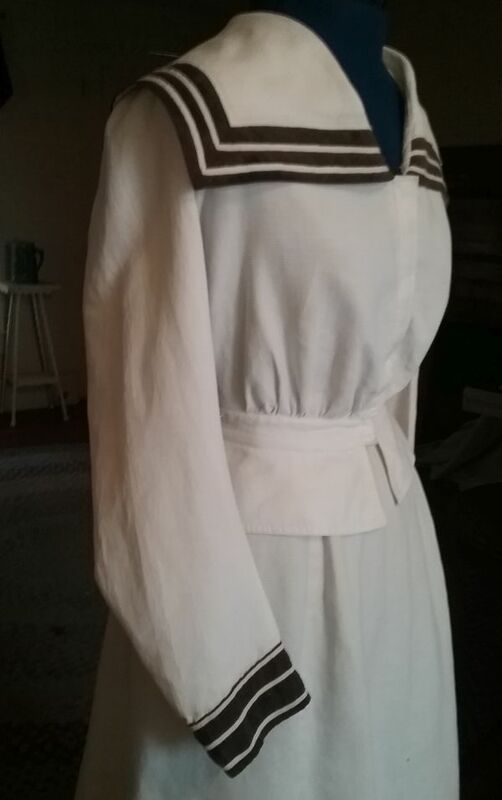 Maybe I need to do a reproduction tie and belt. One of the greatest things about studying fashion history is that there is always something new to discover. 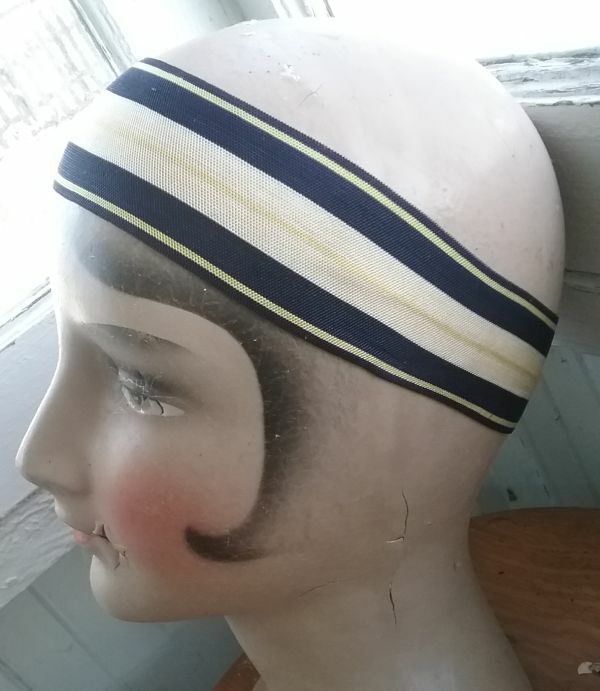 Just when you think you have seen it all from an era, something like the swim cap above pops into your etsy suggestions. 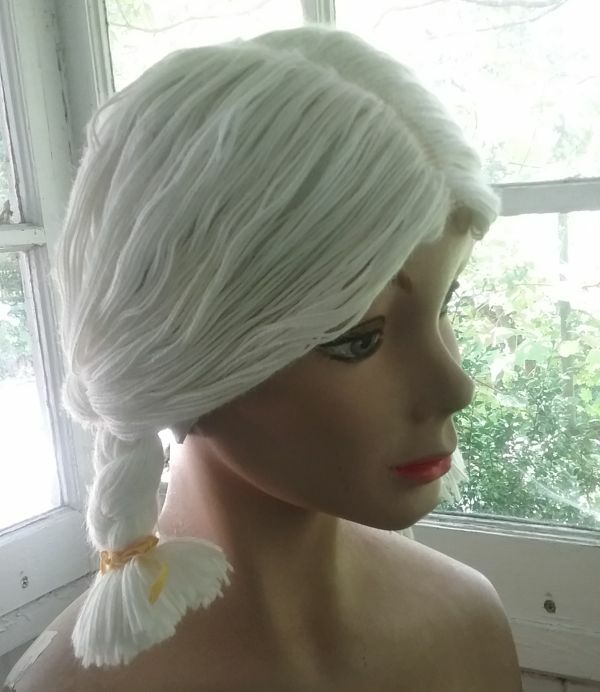 Yes, this is a bathing cap, made from acrylic yarn fused to a rubber base. 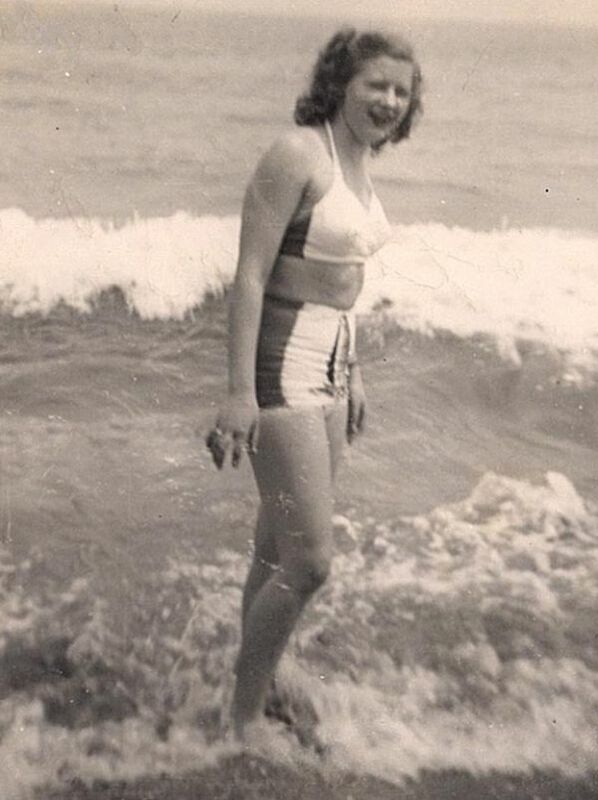 For those of you not around in the 1960s, bathing caps were on their way out, but archaic rules about women’s hair made them mandatory in many public pools. I can remember that my public pool had such a rule, but as men’s hair grew longer in the mid 60s, we began ignoring it. After all, many of the boys had hair longer than that of some girls. There was no big protest, but the caps quickly disappeared after about 1964. 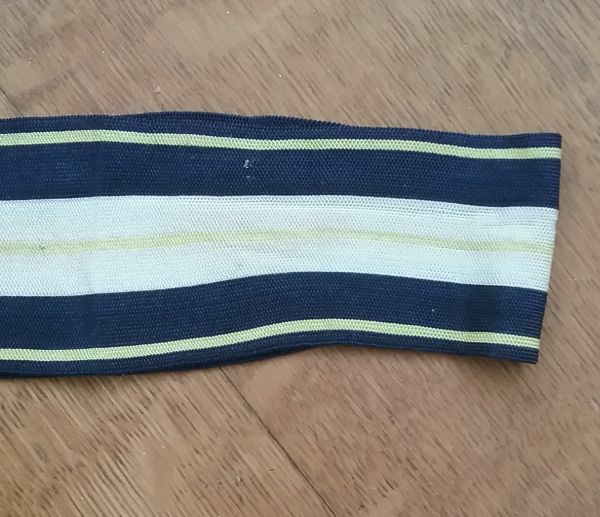 I was hoping to find an ad for this pigtail cap, as there is a brand name – Cole of California – in the cap. Unfortunately, I came up empty, so I decided to think about style. When were pigtails fashionable? It seems odd that any adult would put little girl braids in her hair, but in the time of little girl looks, also known as the mid 1960s, pretty much anything youthful went. I wore my hair in pigtails, and not when I was seven. I was probably around twelve, now that I think about it. So starting with the year 1967, the year I turned twelve, I did some research. To be honest, I spent a few pleasurable hours looking through 1967 and 68 Seventeen, Teen, and Glamour magazines. What I discovered was that 1967 does seem to be the year of the pigtail. I found examples in all three magazines, and the December, 1967 Glamour even had a young woman in pigtails on the cover. So I feel pretty confident in dating this cap to 1967. 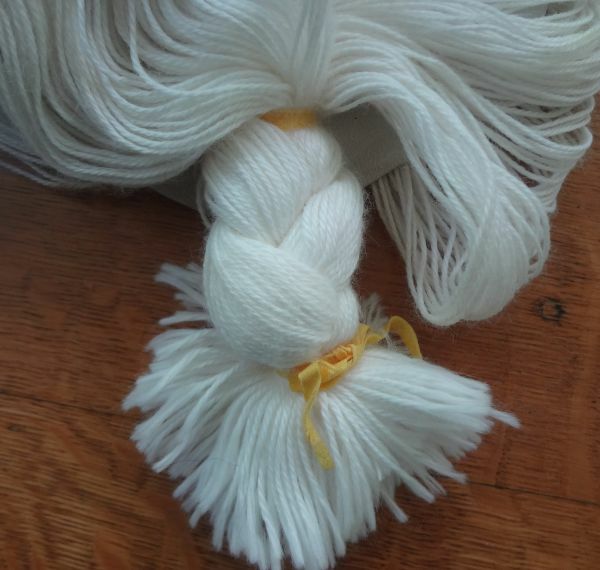 Here is how the yarn is attached to the rubber. There are no stitches in the rubber. 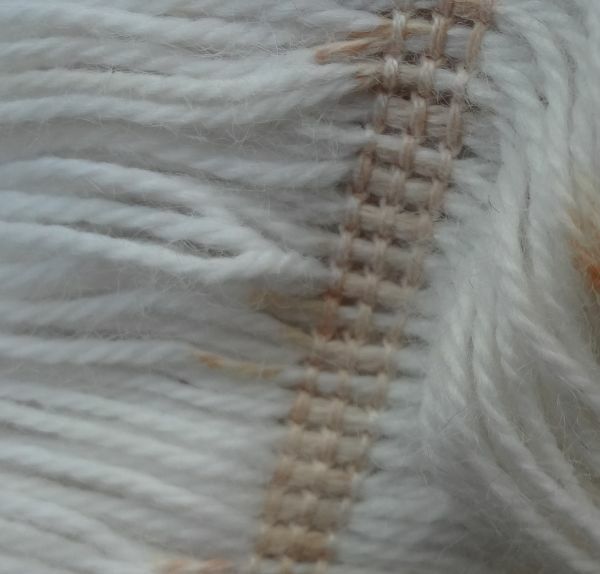 This is more like a rubber thread that is fused on the cap to hold the yarn in place. 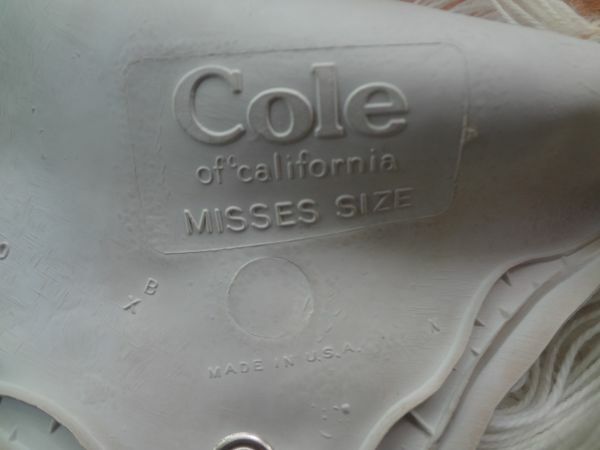 Cole advertised in the major fashion magazines, so I’m holding out hope that original ad can be found. The second cap is just as interesting, but in a more sophisticated manner. If you are one of those persons who feels naked when not wearing earrings, this is the cap for you. 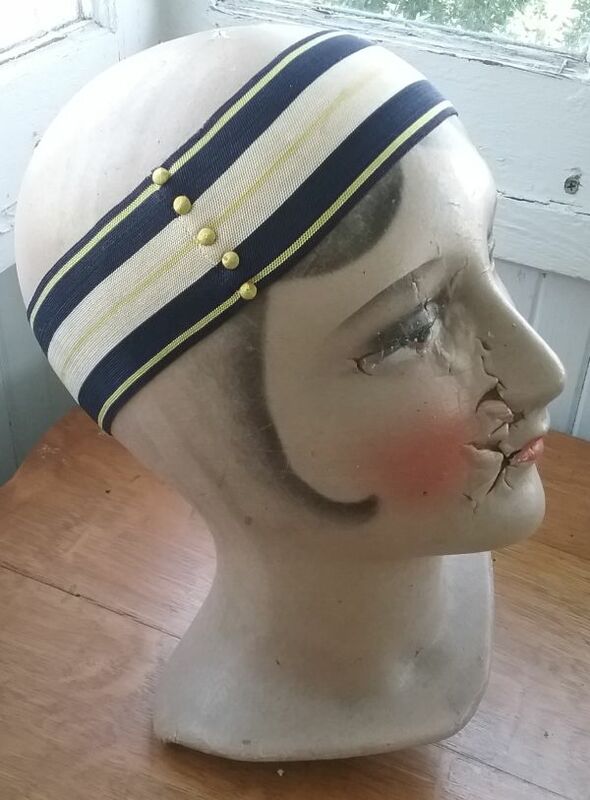 I’ve seen swim caps that were molded to look like hair in catalogs and ads as far back as the 1930s. This one is newer, but when exactly? The biggest clues are the earrings. At first glance I’d be tempted to say 1970s, but by then the swim cap was pretty much over except in pools in retirement villages in Florida. So when were dangly earrings popular? 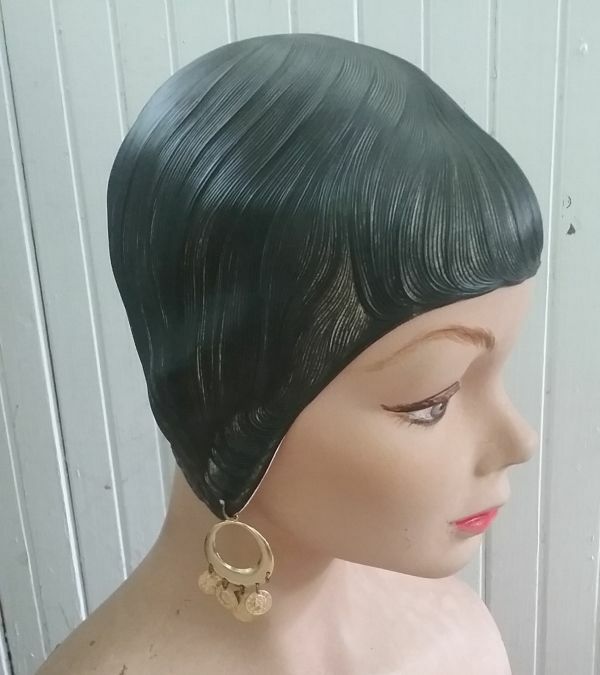 I found lots of long earrings around 1962 and 1963. Could that be when this cap was made? I’m not nearly as confident in dating this one. 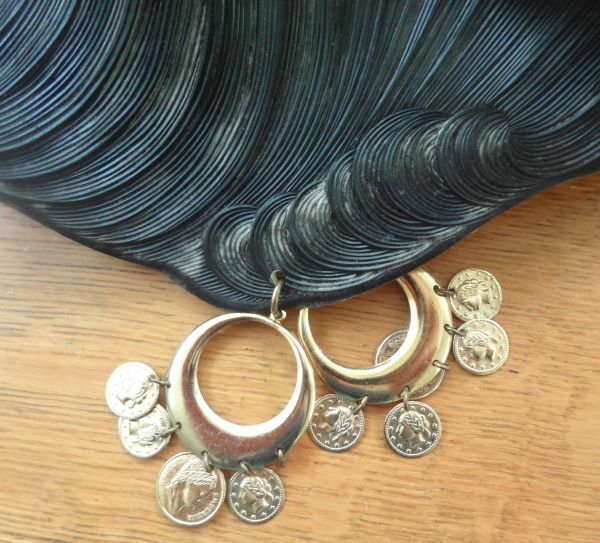 Here’s a close-up of the earrings. The dangles are little fake coins. And look at how they are attached. It has to be some kind of miracle that this survived intact. 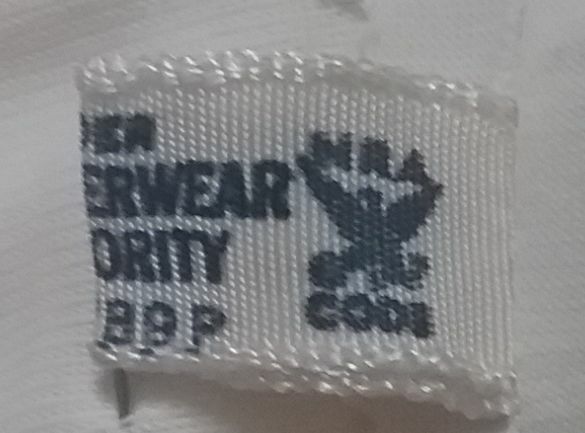 I’m guessing that it wasn’t worn very much. Maybe it was just too outré. Unfortunately there is no maker’s imprint. To be honest, this looks to me to be the type of thing that was advertised in the cheap ads in the backs of fashion magazines. 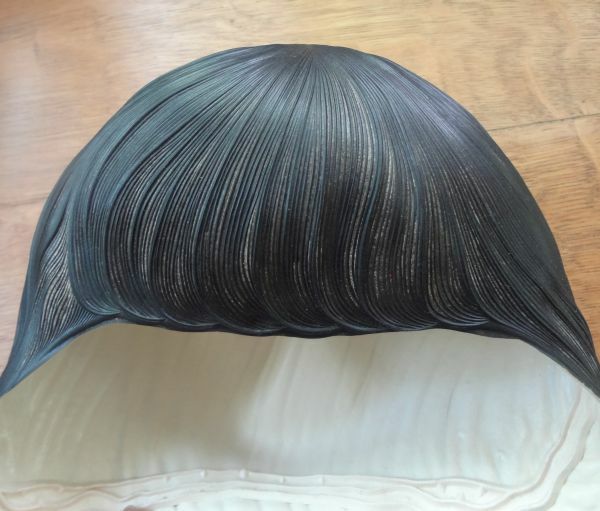 Maybe this came from the swim cap equivalent of Frederick’s of Hollywood. As always, your opinions are welcomed and appreciated.